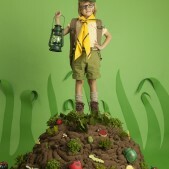 For incredible party ideas, take a look at some of our themed party pages. 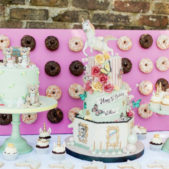 Cakes by Robin have put together a range of some of our favourite party inspiration ideas that are both visually stunning and will ensure your party is a truly memorable event! 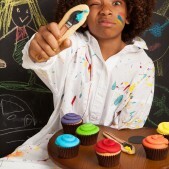 For an amazingly bright and colourful party idea, opt for an artist themed party. Dazzle your guests with bold colours on your cakes and cookies and assault their senses with a party showcasing all the colours of the rainbow! Yeehaw! There's a little bit of cowboy and cowgirl in all of us so choose a western theme and let that inner rootin' tootin' wagon rider loose! Celebrate 150 years of the popular classic Alice in Wonderland! Delicate yet fun, and very very tasty! 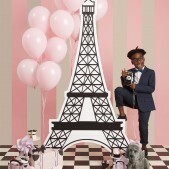 It's chic, it's sleek, it's our Parisienne themed party with all delicately decorated cakes and intricate cookies that are (almost) too good to eat! A monochrome party has never looked so good! If you're stuck on a theme idea but have a favourite colour, a pantone party can really surprise your guests and works great for both boys and girls. Creepy crawlies have never tasted so good! 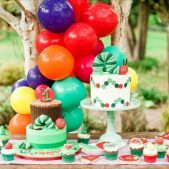 Our insect themed party complete with ladybird cakes, worm cupcakes and beetle cake pops will be the delight of little boys everywhere and are the perfect addition to an insect themed party. 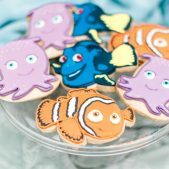 Our sea themed party inspiration includes an octopus cake, oyster and pearl macaroons, star fish and sea horse cupcakes and sea shell cookies. 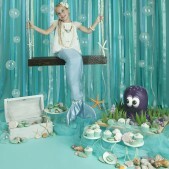 With pretty pearlised colours and tasty things to eat, an under the sea themed party is perfect for any budding mermaid! Pretty, delicate, soothing. These are just some of the words used to describe the Dragonfly party look. 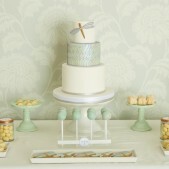 With cookies decorated with a gorgeous pearlised sheen finish and a simply beautiful yet superbly rich tiered cake, tasty treats from Cakes by Robin are the perfect touches to a Dragonfly themed party. 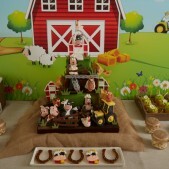 For children of all ages, a farm themed party never fails to put a smile on everyone's faces! 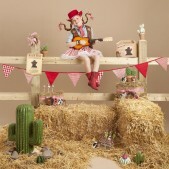 If you're looking for a colourful and truly fun filled party, a farm theme will be loved by all. 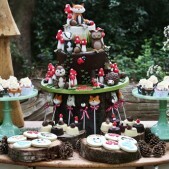 Cakes by Robin can create pretty piggy cookies, tasty tractor cakes or even farm inspired cupcakes? Let us know your ideas and we'll do the rest! 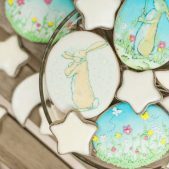 Beatrix Potter's characters are cherished by children and are fond favourites of adults too. 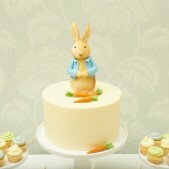 A Peter Rabbit inspired party gives you a wide range of options of colours and ideas for cakes, cookies, cake pops and sweets from vegetable themed cookies to our delicately hand painted cookies, from a tasty carrot cake to a patisserie style cake with a sugar model of Peter on top. Ideal for first birthdays and beyond! 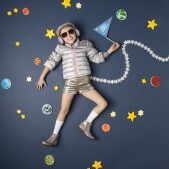 Do you have a cool tween in the house? 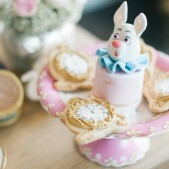 A sophisticated milk and cookies themed party is both bright and colourful, cool and stylish, chic and modish. What little boy doesn't want to go into space? An astronaut has to feature at some point on the list of things to be when they grow up so opt for a Space themed party and give them a little taste of the planets and asteroids in cookies and cake form! In the past few years, with technology turning to social media to share their interesting lives, birthdays, holidays and more, parents have sometimes found themselves under increasing pressure to constantly ‘up the ante’ at birthday parties. This can lead to some very stressful parents! With headlines in the news about tens of thousands of pounds being splashed out on children’s birthday parties, including charging no-show guests, booking a full petting zoo and getting Disney Princess look-a-likes to show up at your little one’s special day, you can get some fierce competition out there. So in lieu of the countless overworked, stressed out parents who are constantly trying to think of new ways to wow their children and their peers, Robin has put together a few fantastic ideas that will make your party shine. You don’t always have to sell an arm and a leg to have a wonderful, meaningful party, so Cakes by Robin offer a number of first class solutions that help create visually stunning events that stick in your memory. 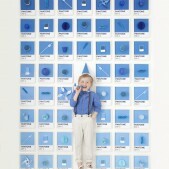 Party Pieces – Fab website catering for every theme imaginable. Order everything online and have it delivered direct to your door! We’ve put together some galleries to show case some of our favourite party themes, take a look at the images for your own inspiration!